It is not an easy plant to care for and requires clean and clear water conditions. Any algae and debris covering the leaves can undermine the health of the plant. It is best kept in soft water with a pH of 7 or lower. Please note some aquarists claim that it will need to go into a period of dormancy approximately once a year. During this time it's best remove it, keep it moist but not wet in the dark for two months at temperatures of around 15.6°C (60°F) . After the dormancy period is up, the plant will "come back to life" once you replant it. These Aquarists recommend you do not let it flower otherwise it will wither so recommend you cut off any long flower stems. But others seemingly can manage to get it to flower and do not removed it from the water. Others claim that keeping the leaves large and well grown before it flowers ensures the Rhizome is well developed and full of nutrients. Then when it does flower the plant is not starved and can keep growing. Remember this plant grows big and will take up a lot of room in a tank. 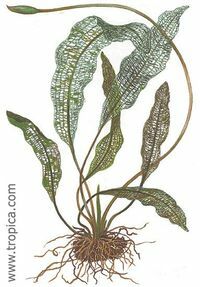 The Lace Leaf has become a popular aquarium plant, mainly due to its novel skeleton-like appearance. This is due to a lack of leaf tissue, only the interconnecting veins are visible. Narrow or wider leaf varieties are also available. This page was last edited on 17 August 2011, at 12:39.